Uconnect's Do Not Disturb function blocks incoming calls and text messages from reaching a paired mobile device. Fiat Chrysler's Uconnect infotainment system will get several new features for 2016, including one designed to help drivers keep their eyes on the road. The features will be available on most 2016 FCA vehicles equipped with an 8.4-inch touch screen, except the Dodge Dart and Journey. Here's a rundown of the features. Do Not Disturb: Blocks incoming calls and text messages from reaching a paired mobile device. Uconnect can be programmed to respond to text messages with an automated reply and to route calls to voicemail. Apple's Siri Eyes Free: Offered on some Apple iPhones beginning this fall in 2016 models. Siri Eyes Free lets users make voice commands using natural speech. 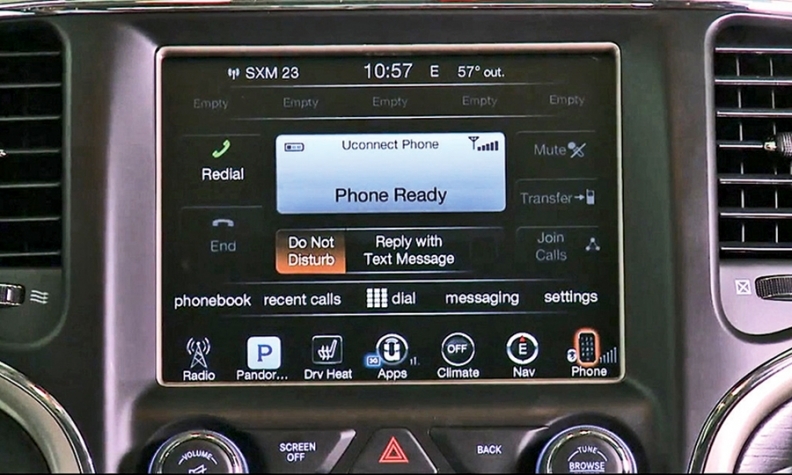 When an iPhone is paired, the infotainment system's normal voice-activation button bypasses Uconnect and instead directs the phone's internal Siri system. SiriusXM Tune Start: Allows channel surfers to hear songs from the beginning when they land on preset satellite radio channels. Drag and Drop menus: Allow users to customize the system's stationary menu bars with the icons of applications they use most. FCA also will include electronic versions of its owner's manual in its Uconnect systems on the Dodge Challenger and Charger and Chrysler 300 for 2016. The Uconnect and powertrain portions will be specific to vehicle identification numbers and can be updated electronically.